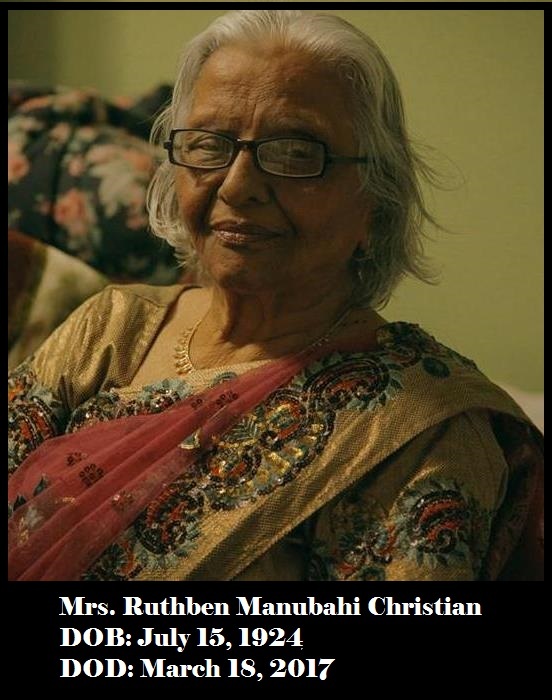 Mrs. Ruthben Manubhai Christian entered into glory of God Today, March 18, 2017. Mrs. Ruthben Manubhai Christian entered into glory of God Today, March 18, 2017. She was widow of Late Rev. Manubhai Christian who passed away in 2007 while his visit to India. Rev. Manubhai was publishing a monthly magazine called “American Christian News” since 1979. After his death Mrs. Ruthben continued to publish the monthly magazine. She is survived by her children Robinbhai, Ravibhai, Madhubhai and Mukeshbhai. May God rest her in peace and grant comfort to her family and friends. Burial will follow but only immediate family will participate. Please respect the wish of the departed soul and family. Thank you for your consideration.